OKWAVE Inc.'s free online greeting card service, Davia, now offers more than 100 Father's Day greeting cards. Father's Day is the perfect time to express your love and appreciation for all the amazing dads in your life. OKWAVE Inc.'s eCard service, Davia, has released more than 100 free Father's Day greeting cards. There is no limit on the number of cards a user can send. 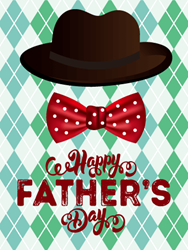 In 2017, the most sent Father's Day card was "To a Father in Style - Happy Father's Day Card," featuring a classic hat and bow tie on a green argyle print background. This trend can be observed in many of their other popular cards for dads. Another best-selling Father's Day card was "Cool Father's Day Card," a similar card with a traditional hat and tie on a blue argyle print background. Davia concluded that classic, stylish cards are a widely chosen design among users. Based on that trend, this year, Davia has enhanced their variety of Father's Days cards to celebrate all dads. Davia added categories for brother, grandfather and husband. Also, Davia has published many Father's Day Wishes cards, with endearing messages, helping customers who may not be sure what to write in their Father's Day card. "Father's Day is the perfect time to express your love and appreciation for all the amazing dads in your life," says Tatsuo Yada, CEO of OKWAVE Inc. "In addition to your father, you can celebrate the many special relationships your share. Davia offers a unique and wide selection of Father's Day cards. Don't miss the chance to reach out by sending a card today!" OKWAVE Inc. operates Birthday & Greeting Cards by Davia, a 100% free eCard service. Davia offers more than 3,000 eCards, as well as customizable birthday calendars and reminders. Davia has served over 14.5 million users since its inception. For more information, visit: https://www.holidaycardsapp.com/. OKWAVE Inc. is the U.S. subsidiary of OKWAVE (3808.NG. ), which offers Japan's first social Q&A web service and enterprise class help desk solutions. For more information about OKWAVE Inc. visit: http://corp.okwave.com, about OKWAVE visit: https://www.okwave.co.jp.